These innovative kids drinks bottles from Contigo® are a revalation for us! Not only are they chunky, sturdy, bright and fun but they also save me a lot of headaches with their clever techniques for preventing leaks. The Contigo® travel range is not exclusively for kids but the range of bright colours definitely appeals to Lara and the clever technology is perfect for preschoolers who like to run around. Lara's Striker bottle has an AUTOSPOUT® button which releases the spout when she needs it. This makes the bottle perfect for taking with us on days out because I can shove it into my changing bag or at the bottom of the buggy and not have to worry about the spout getting dirty as it is hidden away. 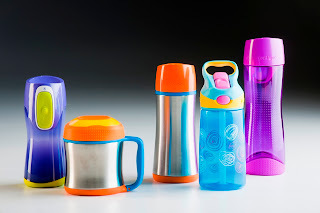 When the spout is closed, Contigo® claim that it is 100% leak proof... and so far I would agree - another reason why I'm happy to keep it in the bottom of my changing bag. Lara seems to get great pleasure out of popping the spout open and closing it again! Lara's favourite bottle though is the Runabout bottle which has an AUTOSEAL® lid which magically closes between sips. Lara has to press the button in order to drink and as she releases the button, the lid closes. Despite being called the runabout (and yes, it is good for a preschooler who wants to run about with it) actually the thing I love most about this cup is that Lara can take it up to bed with her and leave it on her bedside table without any risk of knocking the water over in her sleep. Additionally, when her little sister is roaming the house free, I know that there is no harm in her grabbing Lara's bottle because she can't throw water all over herself. I will admit that I had been getting very bored of mopping up water from that cup on Lara's bedside table EVERY morning until this Contigo® came into our lives. THANK YOU!!! Both of the Contigo® bottles we tried are dishwasher safe in the top rack of the dishwasher. The Striker bottle has a straw inside it which easily comes apart and can be placed into the cutlery rack for cleaning. Prices start at £13.99 which seemed like a lot originally, for a drinks bottle but after a few weeks of use, I am quite genuinely of the opinion that these bottles are good value for money and I always choose one of these over the £4.99 supermarket bottle Lara had before. The Contigo® Travel range is available from Amazon and John Lewis.